What is one thing you learned at Rutgers that has helped prepare you post-graduation professionally or personally? : I learned the value of putting 100 percent into everything I do. I also learned to always stay hungry to learn more. What is a part of your identity that you discovered while at RU (passion for something, political beliefs, etc)? : I always knew I wanted to work in media, but I didn’t really know what that meant. 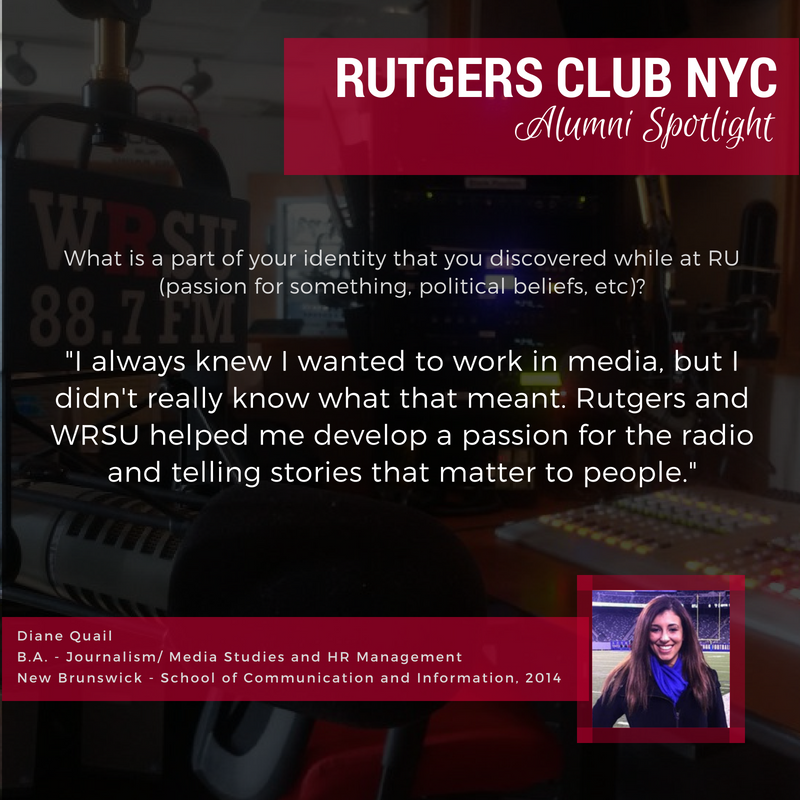 Rutgers and WRSU helped me develop a passion for the radio and telling stories that matter to people. How has your Rutgers education or network help get you where you are today? : I have been told at every job and internship that I have had that I am a hard worker, I’m mature for my age and I have a strong work ethic. I feel that my Rutgers Education is the reason. I also have an entire network of alumni to help mentor and guide me. If you could share one piece of advice with a current freshman, what would it be? : GET INVOLVED!!!!!! I regret not getting involved in more things my freshman year because that’s when you have time to try different things and figure out what you’re interested it. Rutgers offers SO much to offer and there’s opportunities everywhere all you have to do is just ask and get involved. Final thoughts or reflections? : Enjoy every minute of college and if you ever find yourself thinking “I hate school,” or “I’m never going anywhere” Stop it. Rutgers has everything you need to succeed and everyone there wants you to.